Students play at the original site of Shepherds Junior School in Arusha, Tanzania. Target audience: Nonprofits, NGOs, foundations, cause organizations, businesses, brands, individuals, social media consultants, individuals. I don’t think I’ve ever worked with an organization quite like Epic Change. Founder Stacey Monk believes that “intention makes a powerful difference.” Epic Change is really all about intention: intention to build, fund, and support a school that literally changes the lives of children. Intention to listen. Intention to include everyone who wants to be part of the organization, and let everyone own this thing called Epic Change. Epic Change is an example of an organization that really gets the idea of following its members, and intentional listening. Allison Fine recently wrote about this concept of “followership.” The bottom line, as Allison puts it, is to “follow or become irrelevant.” If your organization isn’t willing to listen and include its followers, then it may well become irrelevant. As we’ve written before, Epic Change is anything but. Stacey and co-director Sanjay Patel invite anyone who is “heartfully connected” (Stacey’s words) to become part of every online campaign, from planning through execution. They have three signature events: To Mama With Love, LalaLove, and now, Epic Thanks. Followers’ ideas are listened to seriously and included in the final product. In turn, Sanjay and Stacey also bounce their ideas off of the group and ask for feedback, always listening and always respectfully incorporating ideas. What has become Epic Thanks is truly a result of great followership. One example of followership is the gratitude dance idea. Sanjay Patel posted a video of the dance within the Epic Thanks planning group. Within minutes, the conversation within the planning group evolved from “I’m so not dancing” (me) to “what if we had a dance-off?” (Stacey) to” let’s make a thank-you dance video if we hit our target amount!” And, of course, Stacey replies, “Let me see what we could build to host the video…may be able to get something up tomorrow.” Later that day, Stacey writes that she’s already filmed Leah, Gideo, and Mama Lucy (from the school) dancing and ready for their final thank-you dance video. Every campaign, every organization, every individual engaging with others online has a set of tools and techniques they’ve learned from and rely on every day. Building community and maintaining engagement is often a full-time job – even if it goes unpaid. Epic Change is no different. The To Mama With Love campaign saw them try some new tools as well as some trusted favorites, even with no budget and lots of volunteer time. Two or three years ago, you could have a conversation out in the open and have people organically join in. It’s much more challenging to do that now. Two or three years ago, you could have a conversation out in the open and have people organically join in. It’s much more challenging to do something like that now. The 2011 To Mama With Love activity on Twitter was driven primarily by people very close to the campaign, whereas the first Tweetsgiving was driven by people Stacey didn’t know yet or hadn’t invested time cultivating relationships with. 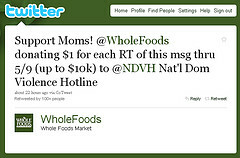 Most nonprofits that jump into social media have one goal: To see how hot or cold the water is. Participating with People – This strategy focuses on creating real dialogue with your stakeholders. Think Zappos (pictured at top). Serving with Content – This strategy focuses on using valuable and interesting content to attract and retain fans. Engage Influencers – This strategy focuses on leveraging real connections you might have with “influencers” (air quotes). You too should put air quotes around “influencers” because one’s influence isn’t half as valuable as their interest. Empowerment – This strategy focuses on empowering your fans to create and share their own content. One of the best examples of nonprofits that do this is Epic Change. Of course, all these strategies can be used in combination. And, of course, you would start with your goals. You can pre-order Geoff’s book here. 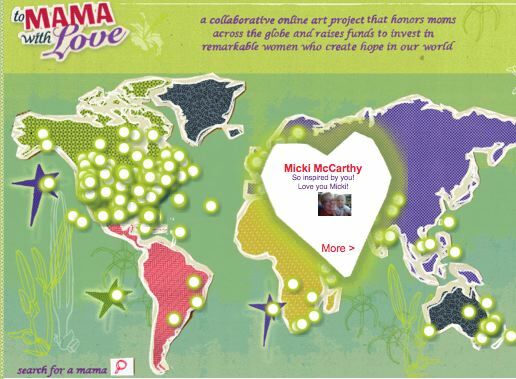 With Mother’s Day just around the corner, let’s give props to To Mama With Love, a collaborative online art project that honors moms across the globe and raises funds to invest in remarkable women who are transforming our world. An initiative of Epic Change, the folks behind Tweetsgiving, To Mama With Love is simply about creating and spreading love. In the grassroots effort, which runs through Sunday — Mother’s Day — participants create socially shareable “heartspaces” that include words, videos, photos and investments in honor of mamas they love. The change-makers are four incredible women who have created schools and shelters for children who face poverty, illiteracy, and lack of opportunity in Nepal, Afghanistan, and Tanzania. Epic Change’s goal this year is to raise at least $65,000 to invest in Mama Lucy’s secondary school in Tanzania; Renu and Maggie’s schools in Kathmandu & Surkhet, Nepal, and Suraya’s women’s shelter in Afghanistan. There are just six days to go before TweetsGiving! Next week, participants will share what they are grateful for through Twitter and other online media and attend gratitude parties around the world. People will donate to a shared cause in honor of that for which they are most grateful. Funds raised will go to support the work of Mama Lucy Kampton (@MamaLucy), a change maker who has transformed her community in Arusha, Tanzania, through her school, Shepherd’s Junior. Learn more and show your gratitude! Scheduled for Nov. 24–26 (Tuesday to Thursday), the 48-hour event created by Epic Change will encourage participants to express their thanks using online tools and at live events. In honor of the people and things that make them grateful, guests will be invited to give to a common cause at events held across the globe.